Activities: Horse riding for an hour in Terelj NP, camel riding for an hour at Khogno Khaan, a visit Khustai NP, Terelj NP, Chingis Khaan statue, visiting local family and stay in their spare yurt, try Mongolian typical meal called “Khorkhog” which is a kind of barbeque cooked with rocks. Clothing: Wind breaker, sweatshirt, hiking boots, cap, sweatpants. We’ll to drive to Mount Khogno Khan Nature Reserve. The mountain is home to hundreds of birds, deer, and gazelle. You’ll be able to go hiking around the area or ride camels for an of hour to the small sand dunes nearby called ” Elsen tasarkhai”. On the way, we’ll visit Khustai National park to see wild horses. Spend the night in a nomadic family’s spare yurt for the guests. We’ll drive to Terelj National park and spend the night in family’s spare yurt for the guests. On the way we’ll visit the Turtle rock. We’ll ride horse for an hour and go hiking around the area. 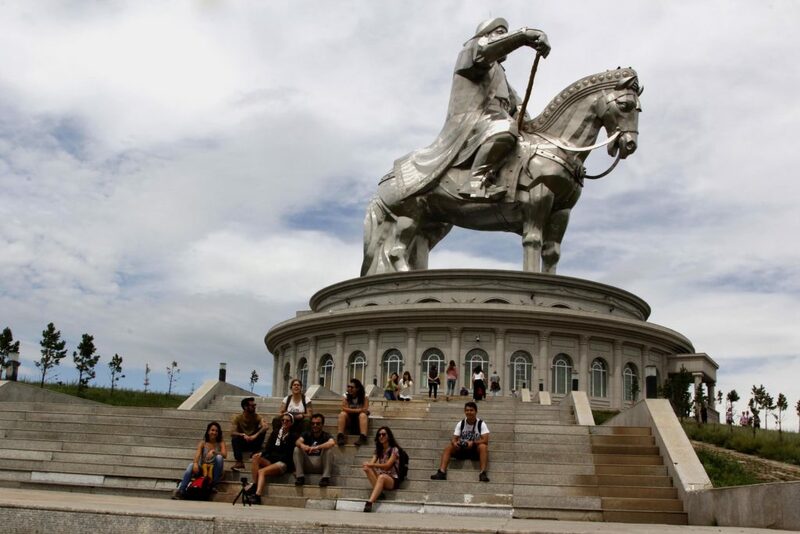 After lunch we’ll drive to the Chingis statue and climb the statue to enjoy the view. And then drive back to UB.